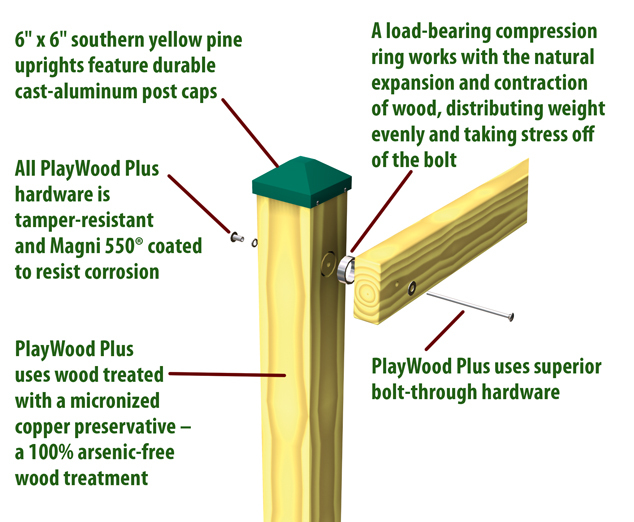 For ultimate strength and durability, PlayWood Plus uses 6”x 6” southern yellow pine uprights. We’re so confident in our uprights that they come with a 20 year guarantee. All wood is treated with a safe micronized copper technology and our tamper resistant hardware is Magni 550©- coated. Each and every PlayWood Plus playground is custom-built to order by wood playground specialists who care, ensuring that it will last for many years to come.